The trip from the US to the British Isles was to follow the path, backwards of course, that my ancestor Thomas Speake took when he immigrated from England to the US about 1660. He was born sometime around 1633 or 1634 someplace in the Gisburn area of Lancashire, and died in St. Mary’s County, Maryland on August 6th, 1681. He married Elizabeth Bowling, who was also a first generation immigrant to the colonies. Both Thomas and Elizabeth were Catholics, settling in the Catholic-friendly colony of Maryland. Family researchers had long suspected Lancashire as one of the probable locations for Thomas’s origins based on the fact that this area was known for Catholic recussants and because there were Speaks found in this area. But nothing had been found in Maryland or English records to firmly tie these two families together…that is…until DNA testing. Another Speak(e) family would leave Lancashire 200 years after Thomas Speake left for America. This Speake family would instead sail in the other direction, to New Zealand. It would be the descendant of this man, in New Zealand, whose DNA would match the descendants of Thomas Speake who went to America, confirming that indeed, this Lancashire family is the Speak family from which the American branch descends. If this seems like the long way around, literally, it was, but it got the job done! That information then allowed us to dig further into the records. Some of the first detailed records we found were for a church in Gisburne, very near the location where our New Zealand cousins family is found, including records where all of his ancestor’s children were baptized. We were hooked. We had found our family line, our family church, our family area….and our family. We wanted to go back, to walk where they had walked, to sit in the church pews that they sat in, to visit the graves of our ancestors and other family members, and to immerse ourselves in the culture and history of where we came from. 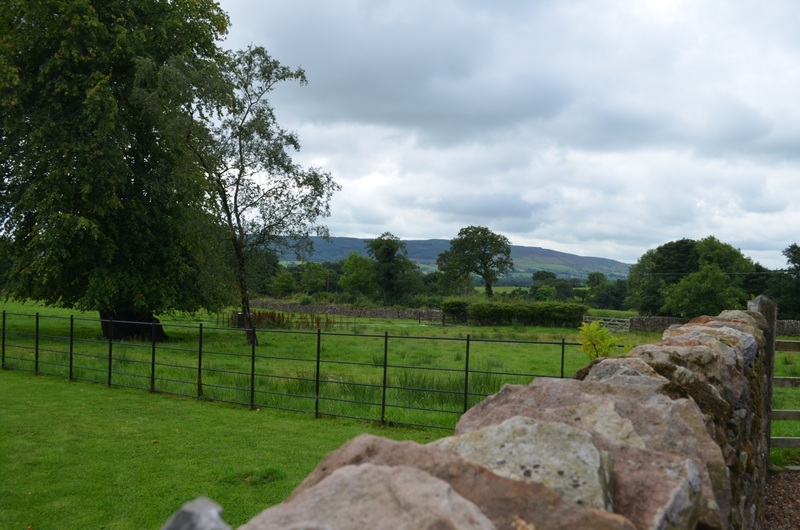 Our family journey began in London and took us through Cambridge, Coventry and finally entering the Ribble Valley on our way to our destination, the Stirk House, once owned by a Speak family. 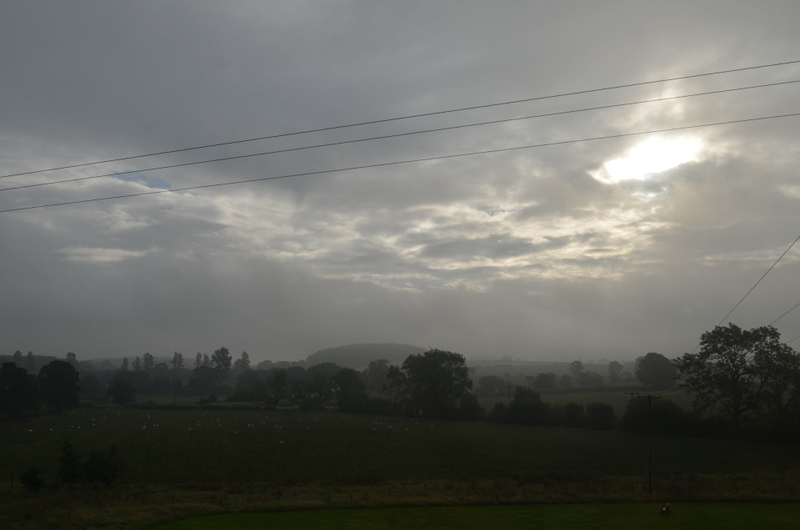 The first morning I woke up at the Stirk House, it seemed surreal as I realized where I was. It looked surreal too, and reminded me a bit of Middle Earth, land of the Hobbits in Lord of the Rings. I expected to see Gandalf any minute. I sat up and looked out the wide picture window, which overlooks Pendle Hill in the distance and the fields that probably look exactly like they did when my 7 times great-grandfather, Thomas Speak was being raised within sight of Pendle Hill between 1634 or so when he was born and about 1660 when he immigrated. These sheep in the field, meaning the white dots, are probably related to his family’s sheep too. Everyone here has sheep. Cattle are quite rare. That’s probably because the locals use a lot of wool because it’s cold and damp here, almost all of the time. It’s like a rainforest here and rains nearly daily, or at least some part of every day. 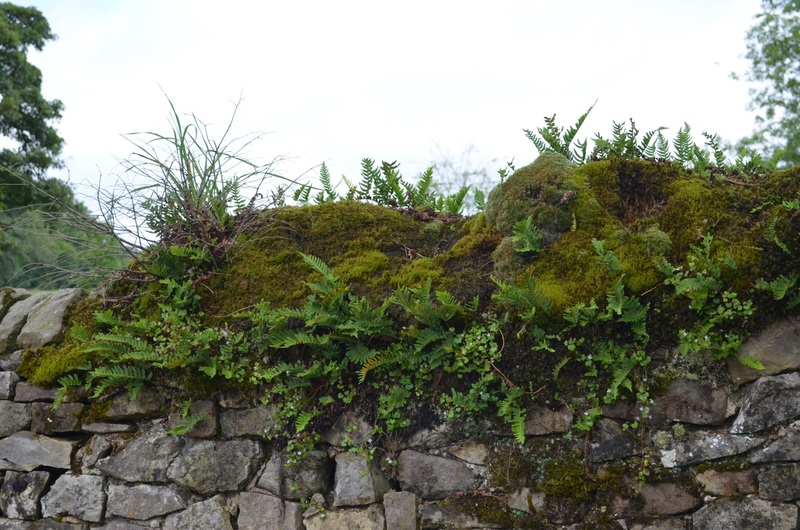 It’s so moist that the stone walls grow both moss and ferns. His stone walls probably looked just the same and he likely would have been sent to repair them as a young man. 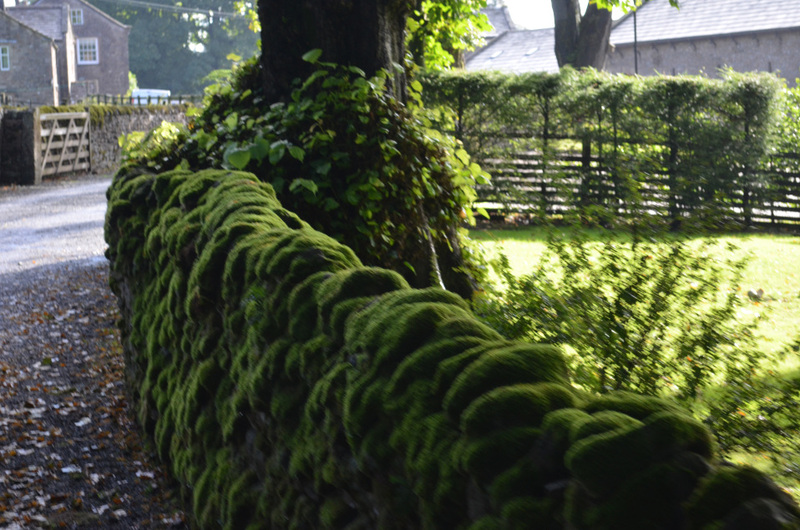 The farms are stunningly beautiful and for the most part, extremely well maintained, including the rock walls that line the fields as well as the roads. Maintenance of these walls is taught to every farm child. 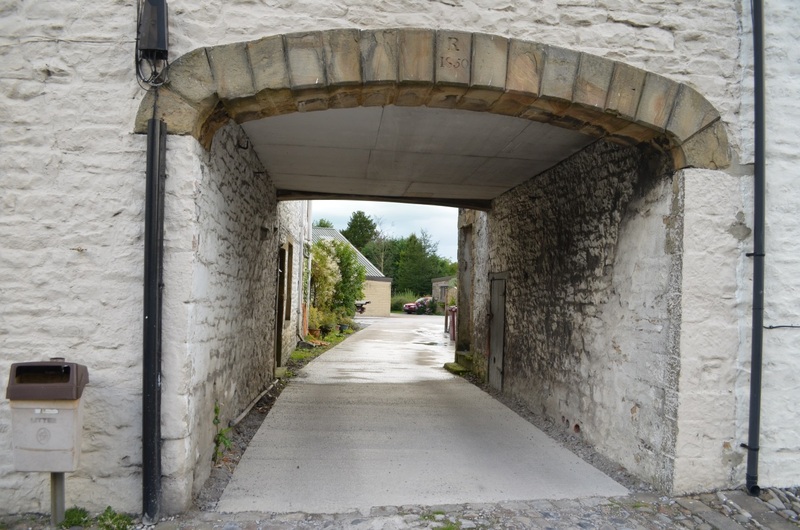 This is a typical road, lined on both sides with rock walls and stone buildings, including barns, although their barns are not large like ours, for the most part, and never wood or pole barns. This wall above is part of the wall to the left below. Notice also the hairpin turns. There was more than once our bus was unable to visit a location because it couldn’t navigate these roads, bridges and very tight turns to get there. 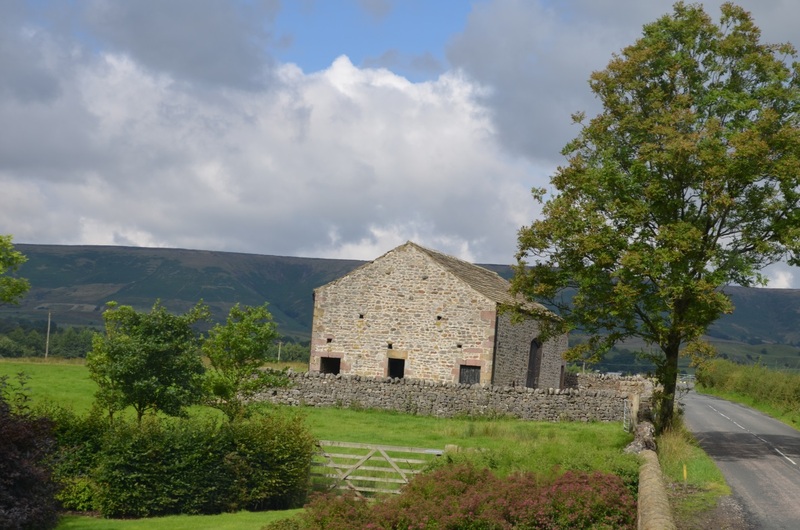 Here’s a beautiful old barn, larger than most, with Pendle Hill in the background. Sometimes there are gates in the walls, seemingly in the middle of noplace. Surprisingly, some portions of this region are very heavily forested. 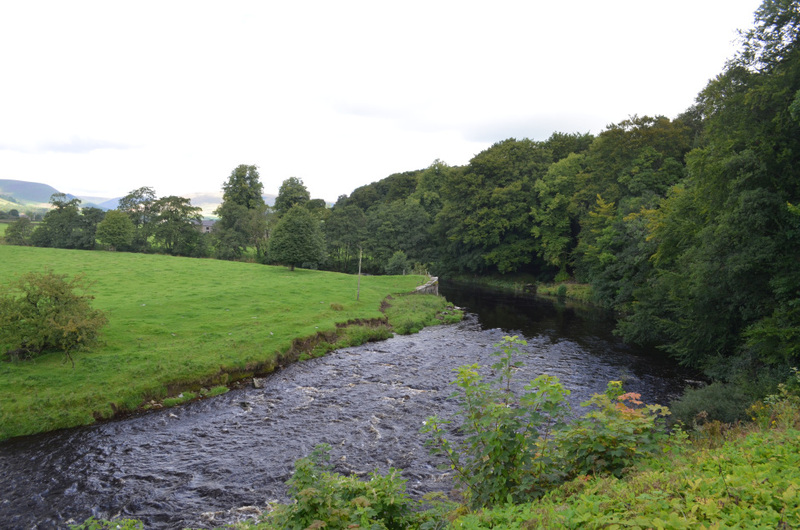 Given that we are traveling in the Ribble Valley, it shouldn’t surprise you to discover that indeed, there is a Ribble River that runs the length of Ribble Valley. The book, “The Common Steam” by Rowland Parker describes in exquisite detail the part that the literal common streams plays in the development, sustenance and nourishment of an area. I would heartily recommend this book to any history buff or anyone attempting to understand their English history and ancestors. The Ribble River, indeed, is the common stream in this valley. All creeks flow into it, and it in turn, sustains the entire valley. Water is essential for humans and the animals on which they depend, and settlements sprung up along water sources. Our ancestors were here. Lunch, on our first day in the Ribble Valley would be at a lovely local pub, the Inn at Whitewell, owned by the Queen, that sits on the Ribble River. 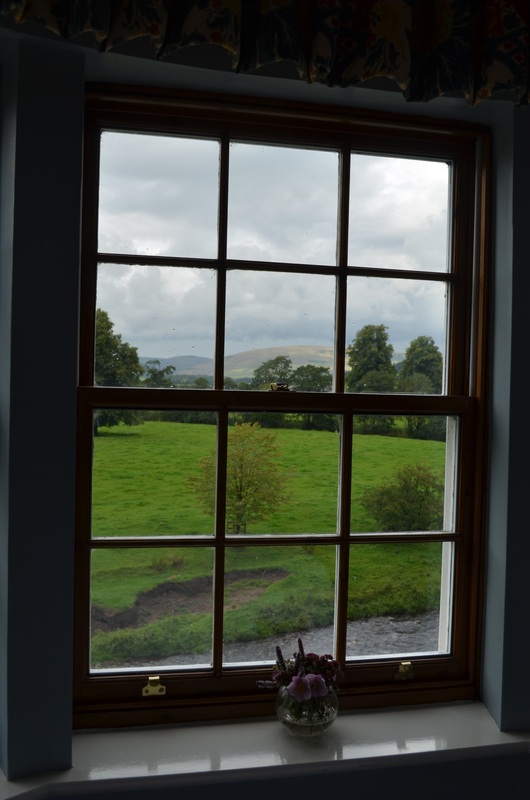 One of the best parts of this Inn is that we got to overlook the Ribble River. It ran, here, when our ancestors lived here. They looked at it as we do today. They probably drank out of it, washed in it and waded across it. Pubs here have a very long history as well, and our ancestors may have visited this very pub and looked at this very scene. This is both the Pendle Hill and the Ribble River from where I was sitting at lunch. Pinch me. I still can’t believe I’m here, seeing what my ancestors saw. Jim and I fully believe in “adventure eating.” When traveling, this means trying all of the local dishes, especially anything the local area is known for. In Lancashire, that would be fish pie and shepherd’s pie. 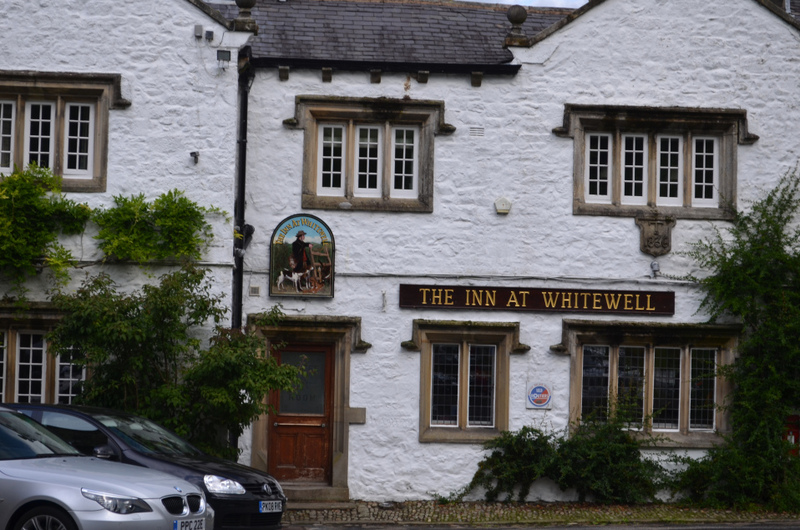 Now I’m not a big fish fan, but The Inn at Whitewell is famous for its fish pie, so I figured if I liked it anyplace, it would be here. Let’s just say that if you really like a fishy taste, this is for you. It included shrimp too, but their shrimp are miniscule. What we call shrimp in the US are called prawns in England. 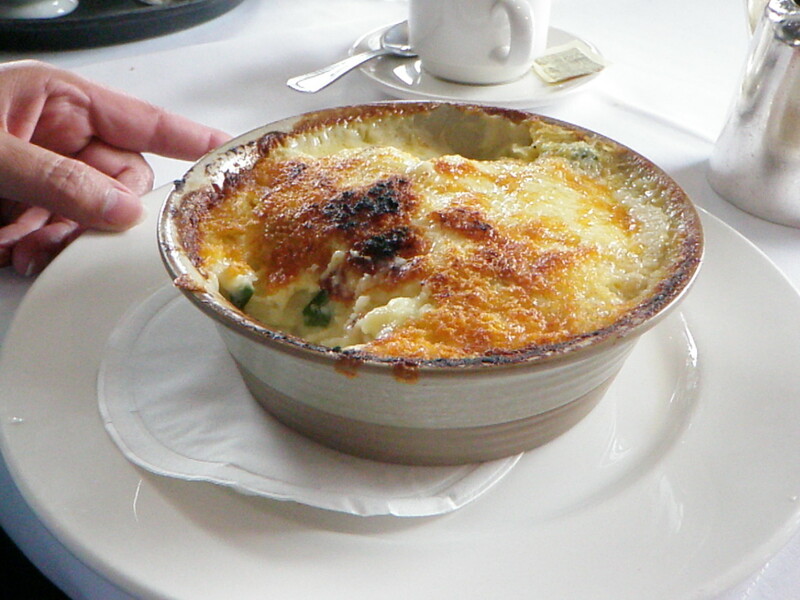 The baked cheese and potatoes were wonderful on the top of the fish pie. 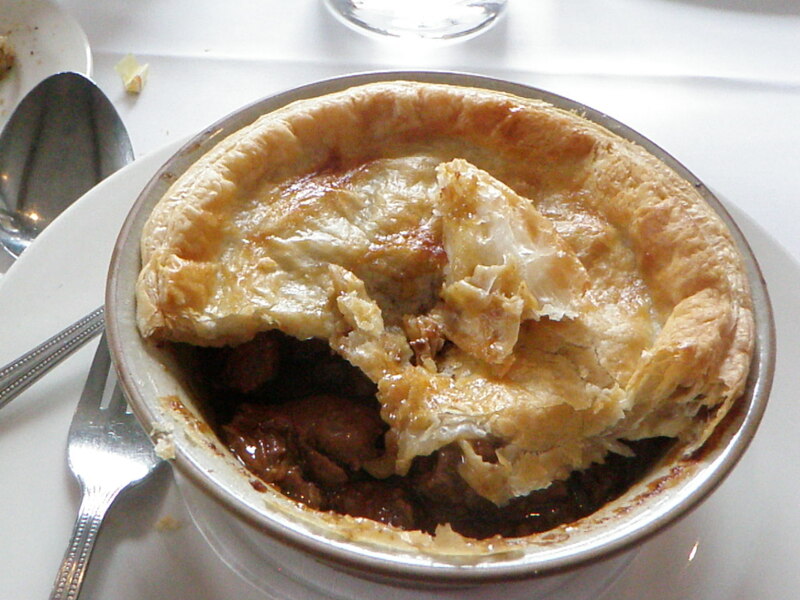 I liked the shepherd’s pie better, but how can you go wrong with beef stew and pie crust. This isn’t only English, it’s all American too. I’m glad I tried both. I have tried not to make these articles too personal, but I have to share a couple of photos that are really quite special. 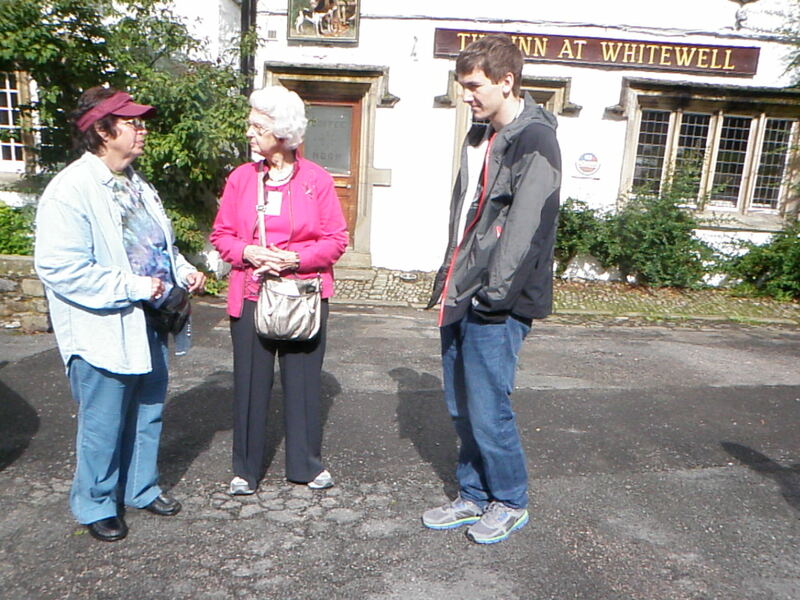 My cousin, Dolores and I are chatting outside the Inn at Whitewell. I “met” Dolores many years ago, back in the 1980s, by letter. I still have her original letters and copies of documents she so kindly copied and mailed to me. I was just beginning my genealogy journey and she seemed so very wise and knowledgeable, not to mention kind. Little did I ever know just how far we, together, would travel, literally. Dolores brought her grandson along as well, a college student, standing to our right. He is a lovely young man, very helpful and Jim and I thoroughly enjoyed spending time chatting with him about computers and geeky techy stuff. I can’t imagine a young man his age who would actively choose to spend his time with his grandmother, but this young man is truly exceptional. I wish I had a daughter the right age:) This is the next generation of genealogists we’re raising! Another family group on our trip included Susan Sills, the President of the Speak(e)(s) Family Association who coordinated most of the trip. She brought her son and his 2 daughters along. In fact, we had just celebrated the oldest granddaughter’s birthday during our lunch at the Inn before we took this family photo. How does a birthday get better than that??? You can hardly take a picture without Pendle Hill being in the background. After lunch, we tried to visit the ruined castle at Clitheroe and through a series of quite humorous events, including the bus being too tall for a bridge, twice, we gave up and went on to St. Mary’s Church in Gisburn, which was our ultimate goal anyway for the day. Below, you can see one of those hairpin turn types of places we couldn’t navigate. Our bus driver was incredible and I was utterly amazed at his patience. I was sitting in the “jump seat” beside him where the tour guide normally sits, due to motion sickness, and I know I heard him swear under his breath. The poor man had about 10 women trying to “help him,” all at the same time. But he was a married man so he knew exactly how to handle that. He ignored everyone…and muttered. I must say that the Clitheroe folly bore us a gift and that was the gift of going over the mountain, meaning Pendle Hill, because the bus had to find a different way into town. We got to drive around the countryside and it was picturesque. Look at this beautiful arched bridge. I have to wonder if it was originally a Roman Bridge from the Roman occupation beginning in the year 43. This area did play host to a Roman fort. Many places look like they were straight out of Thomas Kincaid pictures. 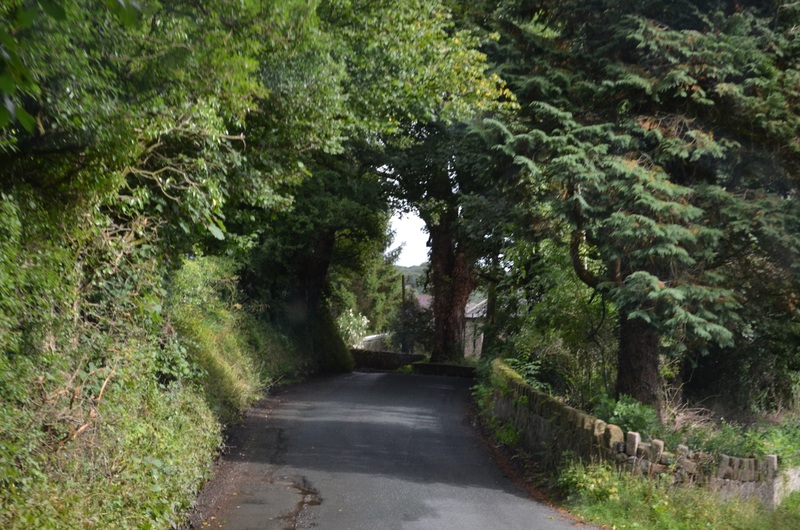 There are rock and hedge walls along the roads. It’s raining here, with Pendle Hill in the background. 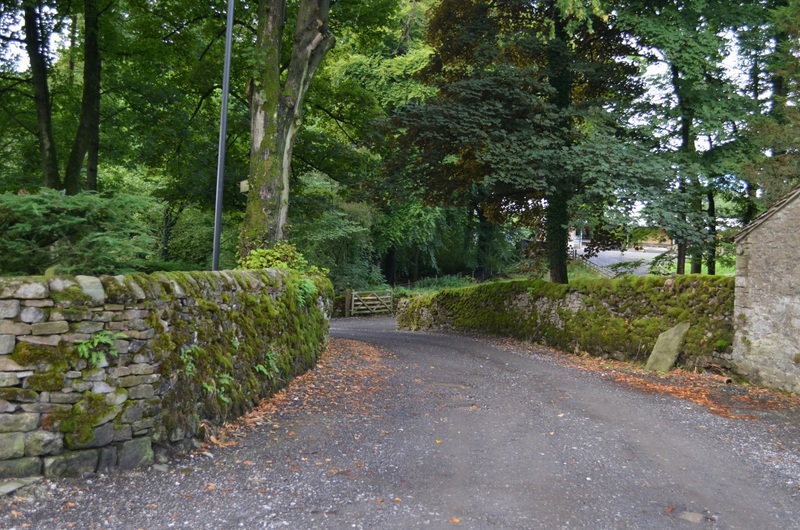 The villages are comprised of “cottages” as they are called, and in some places, on Pendle Hill, for example, the sheep free range and graze on the moor lands. And the flowers. Oh, the flowers. Lovely quaint flower gardens are found tucked into the most unlikely places. With all the rain, the gardens were lush and lovely. Oh yes, and did I mention that the houses are built perilously close to the road, because the road used to be a cart path hundreds of years ago. And yes, these houses ARE that old. What we consider old is rather new to them. England is an ancient land and ruins pop up from time to time in the most unlikely places. We didn’t have time to stop, but these ruins are of Sawley Abbey. Sawley Abbey was an abbey of Cistercian monks in the current day village of Sawley, Lancashire, but historically in the West Riding of Yorkshire. Created as a daughter-house of Newminster Abbey, it existed from 1147 until its dissolution in 1536, during the reign of King Henry VIII of all England, Ireland, and France. If you’ll recall, it was King Henry’s reign that created the religious persecution of Catholics, following his break with the Catholic faith and his installation of himself as the head of the Anglican Church. He disbanded, dissolved and destroyed the monasteries and abbeys between 1535 and 1541. Our ancestors would have witnessed this, and probably felt strongly about what was happening. This abbey suffered that fate, although some pieces of stone and wooden items such as the rood-screen were installed in other regional churches as an attempt to salvage the sacred. 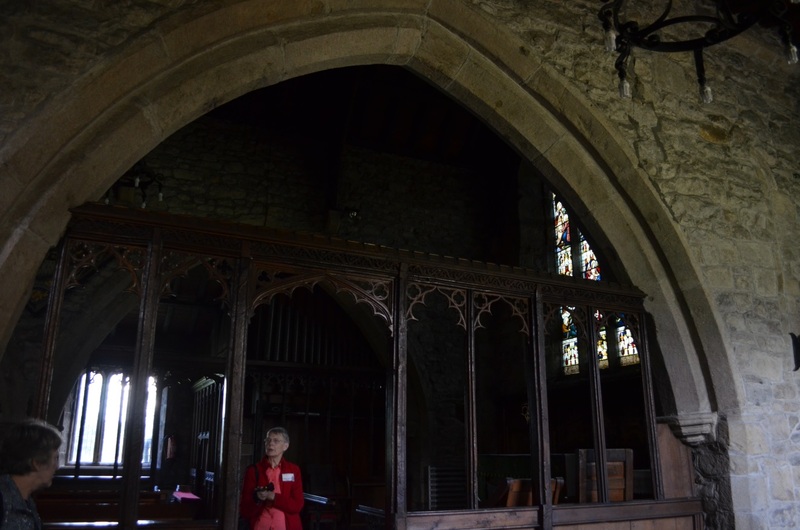 This rood-screen, above, being the wooden divider between the chancel and nave, from St. Mary of Gisburn, is not one thought to be from Sawley Abbey, but is from the 16th century. So, if you think about it, all of these church buildings that you see that existed during or prior to that time were at one time Catholic Churches that became Protestant, likely under duress. To defy the king was a bad idea, a very bad idea, a lose-your-head bad idea, so many became Protestant and the Catholic recussants went underground, practicing Catholicism in hiding and under threat of death. Many martyrs were created during this period. I learned that you can tell which churches were originally Catholic by looking for one particular telltale sign. In the Catholic faith, sacramental wine must be poured into the earth, directly, so that unsavory people don’t somehow come into possession of it and use it for witchcraft or other “unholy” purposes. 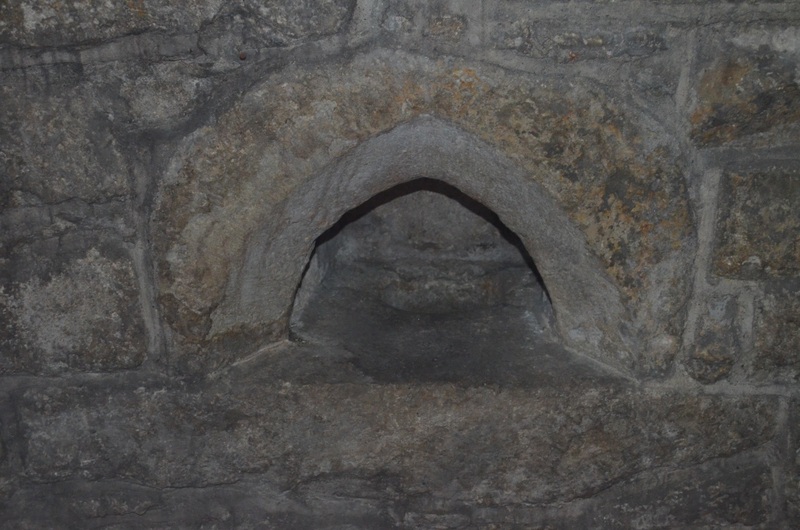 Built into Catholic churches, at least Medieval ones that existed prior to Henry VIII’s “conversion” to Protestantism, is an orifice similar to a bowl built into the wall for exactly this purpose called a piscina. If you look closely, you can see the drain hole, which leads down the wall directly into the earth. This is typically located someplace towards the front of the church where the Priest would dispose of the leftover Sacramental wine. This piscina is from St. Mary’s of Gisburn. Another hint that a church was once Catholic is the Holy Water Stoup, which may look something like a piscina except without the drain. 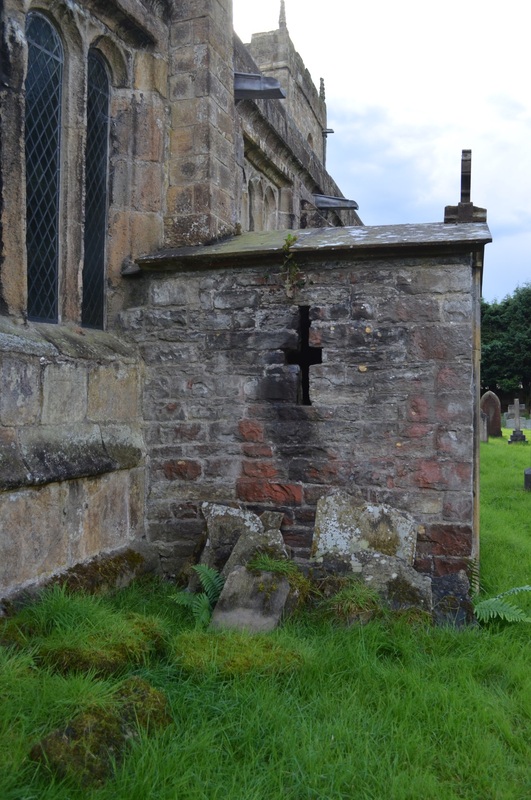 The stoup is used by the congregation to cross themselves with water as they enter the church, so is therefore generally found in the front near the door, or what was the door at that time. 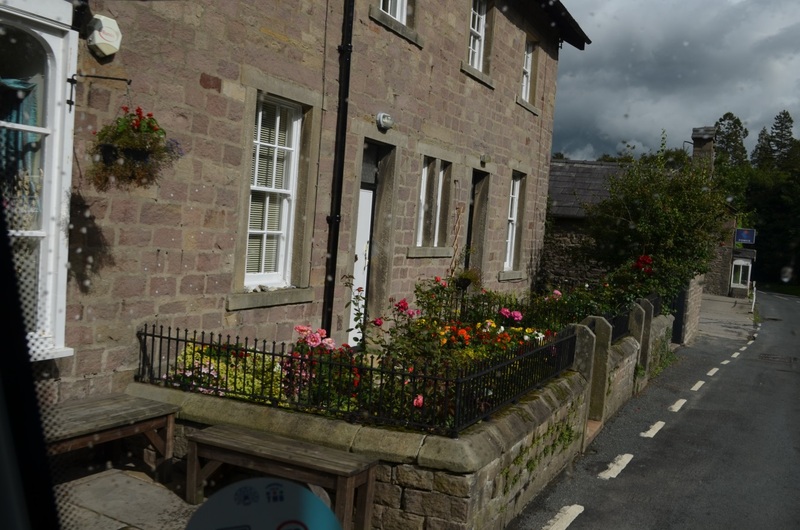 As we arrived in the crossroads village of Gisburn, the excitement was mounting. 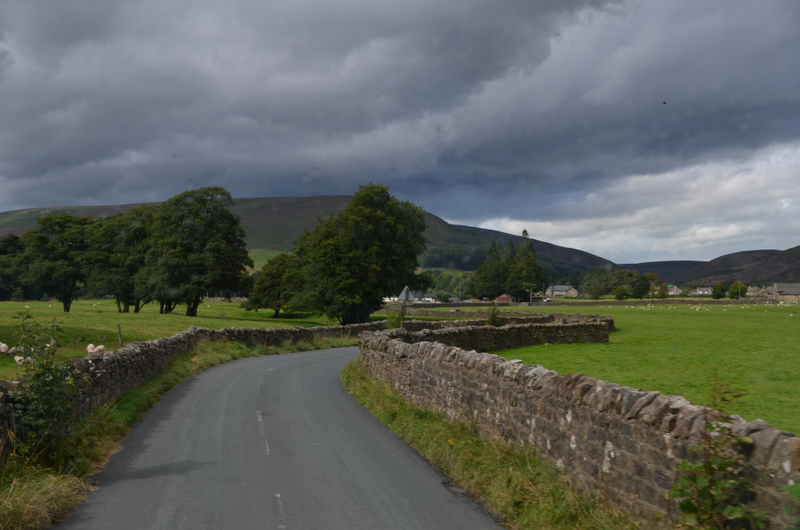 Gisburn was one of the villages where our Speak family was known to have lived, on the surrounding farms. Gisburn was mentioned in the Domesday book, created in 1086 as England’s first census, in essence, for taxation purposes. The manor of “Ghisebum” was part of the Percy fee. It was passed to the Abbot of Salley (Sawley) in 1224 and disposed of by the King during the monasterial dissolution. In 1613, Gisburn passed to the Lister family. In 1797, upon threat of invasion by Napoleon, Thomas Lister raised a troop of cavalry and for his patriotism, he was named Baron Ribblesdale of Gisburne Park. St. Mary the Virgin church, called St. Mary’s of Gisburn, did not exist yet when the Domesday book was created, but was dedicated in 1135. It has been expanded and revamped over the years. Most of these small medieval churches still don’t have either running water or restroom facilities today. St. Mary’s serviced all of the nearby farms. The village itself isn’t nearly as old as the church, dating from the 17th century. 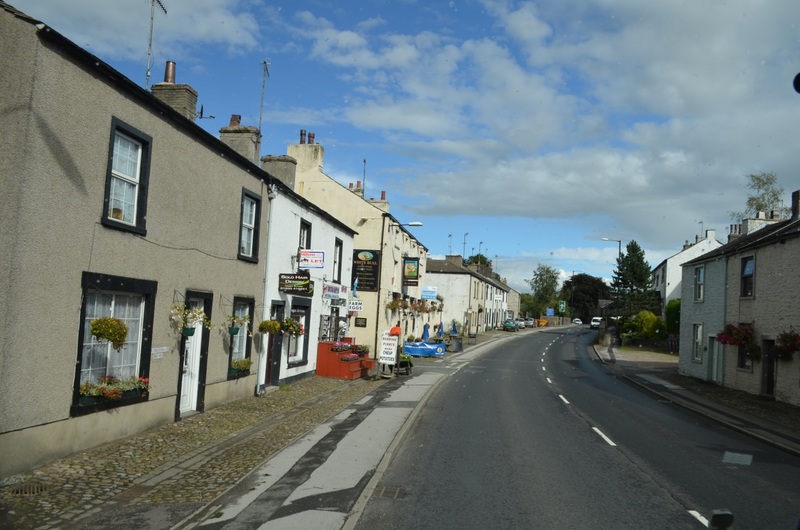 Located on the main road connecting Lancashire and Yorkshire, trade, and a stage coach stop, was what fueled the village of Gisburn. Our first glimpse of St. Mary’s Church, where many Speaks were baptized, married and buried, beginning in the earliest records in the 1600s, was from the rear, across the gravestones of her departed members. 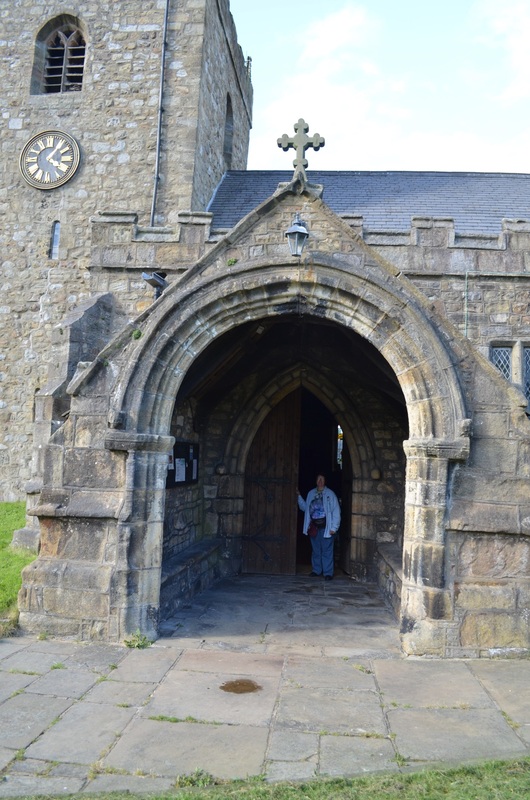 At St. Mary’s Church in Gisburn, sadly, no one was available to meet us, but they did leave the church unlocked. We spent time in the church and the churchyard, but found only 3 stones from the Speaks family. Their burial records begin in the early 1600s, and it’s obvious from translating those records that they served a number of other locations, villages and farms, in the area. We find the earliest Speak burials beginning with Anna, daughter of William, in 1602. Not all burials give the location of the deceased, but those who do are all Gisburne through 1653 when a series of other locations is given. Of course, these locations may not be new, they may simply have been among those without a location given earlier. 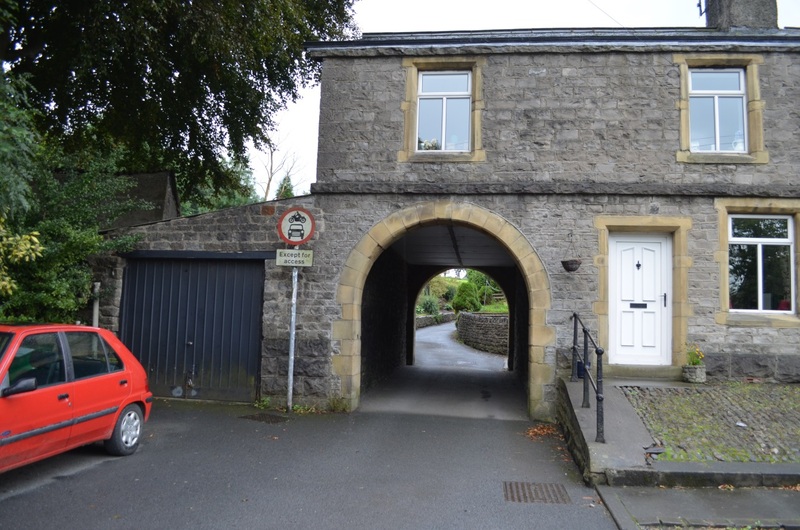 Locations include: Gisburne, Howgill, Rimington, Paythorn, Twiston, Miley, Horton, Varleyfield, Pasture House, Waitley, Todber, Watthouse, Yarside Bracewell, Martintop and Newby. This list takes us through 1828, when the Speak burials cease until in the mid 1900s. The records may not be complete. 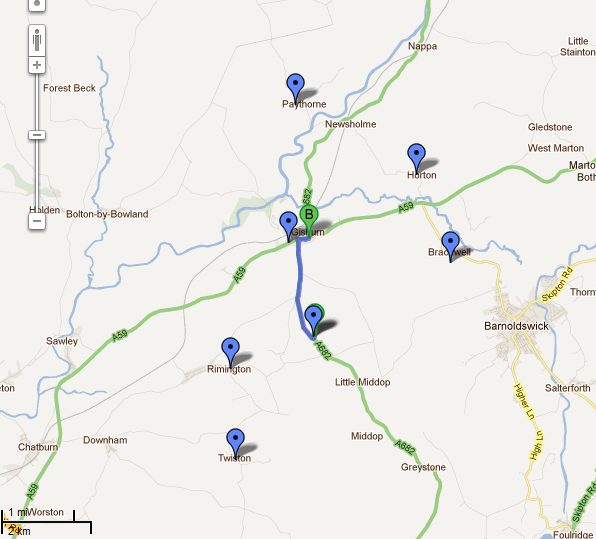 On the map below, you can see that all of these locations that have corresponding locations today are within 2 or 3 miles of Gisburn(e). Those locations that do not exist on the map today may well have been farm or manor names that disappeared instead of becoming hamlets. The location just below Gisburn with no name is Todber. A caravan park is located there today, but otherwise, it has disappeared. 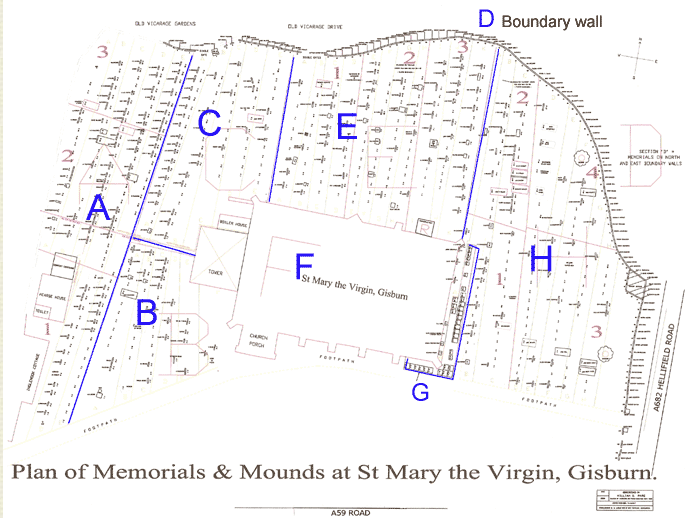 The cemetery is very old, as old as the church, and there are many unmarked graves as you can see on the map, below. Notice the fence or boundary wall in this diagram. We’ll talk about it in a minute. It’s not what you think. A bit of English history may be somewhat enlightening. This group of Speaks does not appear to be landowning. In other words, they were not royalty, were not wealthy, did not have coats of arms, etc. In medieval England, if you were not a land owner, then you were a tenant farmer, either free or bond. Bond did not mean slavery, but it did mean you had little freedom to leave. However, the freedmen had little opportunity to leave either, required the manor owner’s permission, and there was no place within the British Isles to go anyway that wasn’t already populated. We were excited to enter this hallowed church of our ancestors. I love the door. 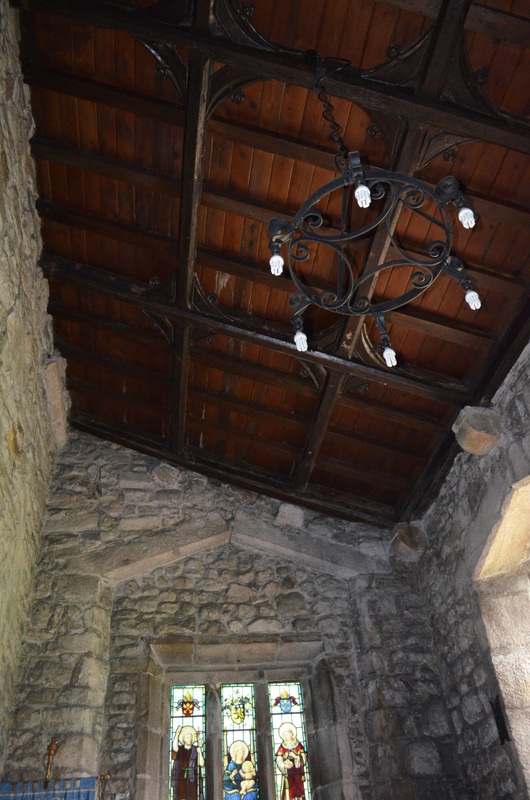 The porch is a 15th century addition with a beautiful cross that protects a 13th century door build on a 10th century foundation. Notice the defensive arrow slits build into the tower so that our ancestor could barricade themselves into the church and defend their position if need be. 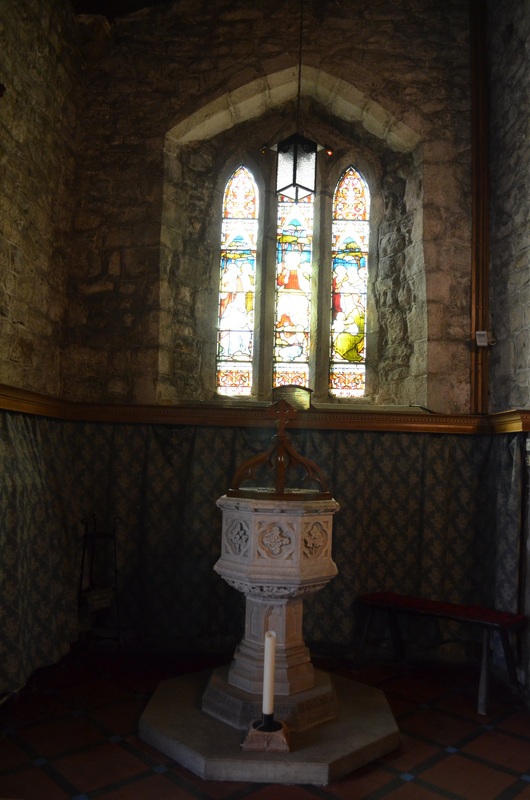 All of the children of the ancestor of our New Zealand cousin were baptized here, not in this exact baptismal font from 1875, but probably one similar and in this location in the church, so we know the family didn’t live far. Cemeteries and burials are handled very differently in Europe than they are in the US. At first, this was rather appalling to me, but I came to understand that it is simply a cultural difference, although there is a part of me still very uncomfortable with the situation. They reuse graves. They may move stones as well. 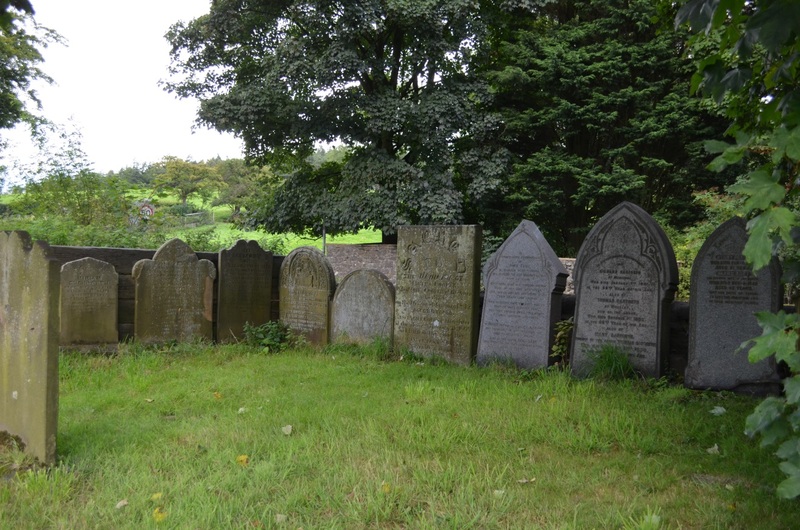 Some churches simply remove old stones, and in doing so, they make maintenance easier, or reuse the burial plot, but they also lose all track of who was buried in that location. 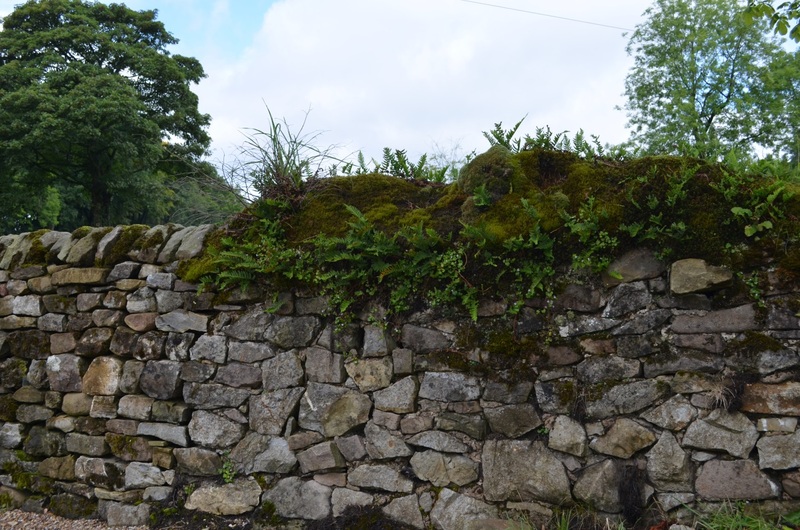 In the photo above, the old stones have been relocated to the wall along the road to make mowing easier. If you look carefully, you can also see that reflected on the cemetery map. The relative wealth of a church and its parishioners can be judged by the number and quality of stained glass windows in the church. Each window has a story, both in terms of what the window is displaying and in terms of the history of the window itself. Keep in mind that until recent generations, most people could not read so the stories told in the church windows served to remind the parishioners of Bible stories and morals. 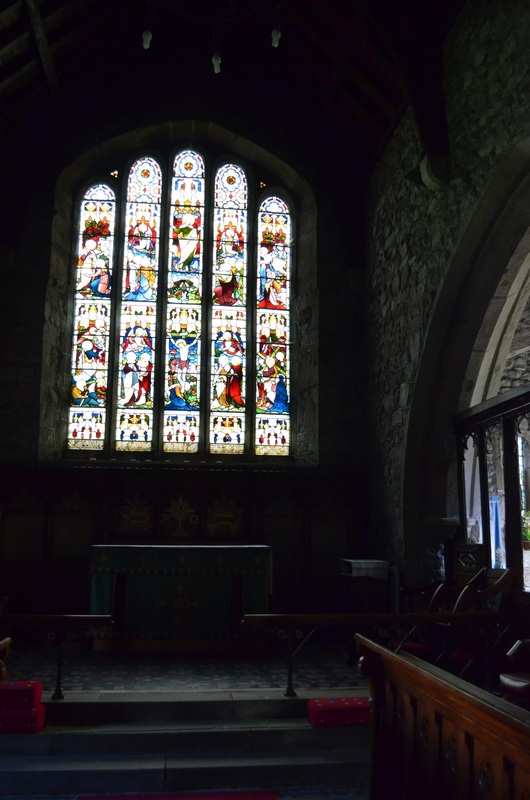 It’s believed that some of the stone in this church, particularly the supportive gables, archway and columns were rescued from Sawley Abbey, just 4 miles away, when it was destroyed. The church was expanded about this time. This beautiful carved arch is believed to have been rescued from Sawley Abbey. The original roof structure still remains. 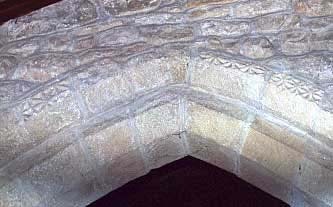 It looks similar in many Norman era churches. After the others left, I remained in the churchyard and discovered why it is that none of the oldest stones are in evidence that might correspond to the earliest burials. There are two stacks of stones behind the church that appear to be unreadable. These grave locations have probably been reused for a new burials. Burial space is very scant after hundreds of years, not just here, but all over Europe. The “normal” time for a grave to exist before it is reused in Europe is about 20 years now, except in some of these small villages and towns where many of the older graves do still exist. 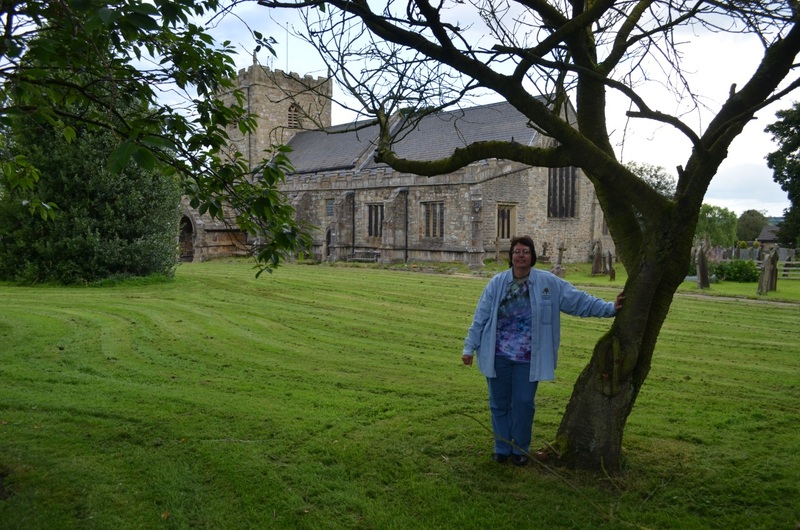 We know from the church history that the lawn, behind where I’m standing, below, and the church, is where the stones that now line the wall were originally located. 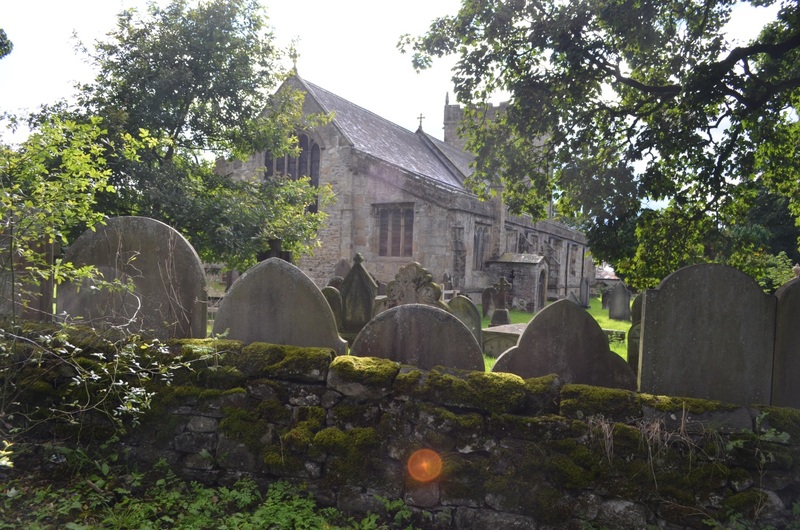 St. Mary’s of Gisburn is a truly beautiful old church and so full of our family history. We know that our relatives, and probably our ancestors, rest in this dirt and worshiped in this church, first as Catholics and then, at least some, as Protestants. We have no record that our Thomas was baptized here. But he had to have known of this church, passed it, and was probably in this church from time to time. He was assuredly baptized in one of these local churches unless he wasn’t baptized in the Anglican church at all, which is certainly possible, considering the family’s Catholic beliefs. Our Thomas is had a rather unique profession, that of a tailor, as he stated in his first few years in Maryland. John David Speak checked the 776 Speak family records he has collected from the parishes surrounding this area and he found only three records that indicated Speaks men were tailors, and all three were from Gisburn where in 1613, Ann the daughter of William, a tailor was baptized, in 1647, Sicilia the daughter of Richard, tailor, was baptized, and in 1662, Thomas, a tailor, was buried. The only other Thomas record found is at Downham, just 4 miles distant, where, indeed, a Thomas Speak was baptized in 1634. Fortunately, Thomas is a very unusual name in the Speak family. Unfortunately, there is also a marriage record for a Thomas in 1656, and his wife is buried in 1667, several years after our Thomas is known to have been in Maryland and having children. Other church records from this area were lost in the English Civil War and record keeping was officially suspended altogether for an 11 year period between 1649-1660 when Cromwell was on the throne, although some records do still exist. They are however, not consistent. One record from this area that does exist and functioned as a type of census was the Hearth Tax Return, taxing people on the number of fireplaces they had in their home. It’s also significant because tenants rather than landlords paid the tax on their property, so in essence, we obtain the name of every householder. The Gisburn tax list is dated 1672 and the Blackburn Hundred for Downham and Whalley is noted as 1666-1671. Both of these dates are after our Thomas was in Maryland, but still, it will tell us where Speak families were located in this region. Thomas of Downham, who married in 1656 and whose wife and daughter were buried in 1667 should be accounted for, but he is not listed. Nor is his household under his wife’s name. So where was Thomas Speake and his family? 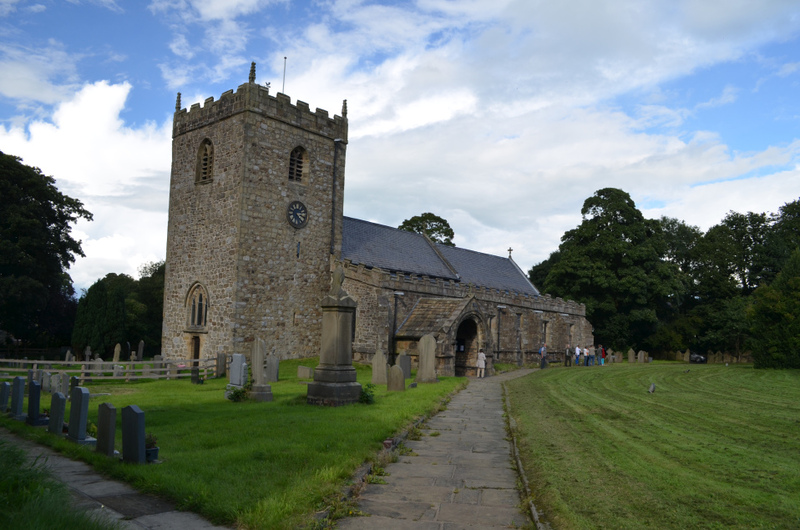 There were three Speak households in Twiston, which is where Thomas who was baptized in Downham lived, according to the Downham church records, two households in Gisburn (Rimmington), one in Stansfield near Halifax and two in the Newchurch area near Pendle. Of the 6 entries in Gisburn, Twiston and Stansfield, 5 are named John, as was the son of our Thomas Speak. It’s probably safe to say that either Thomas’s father or grandfather was named John. 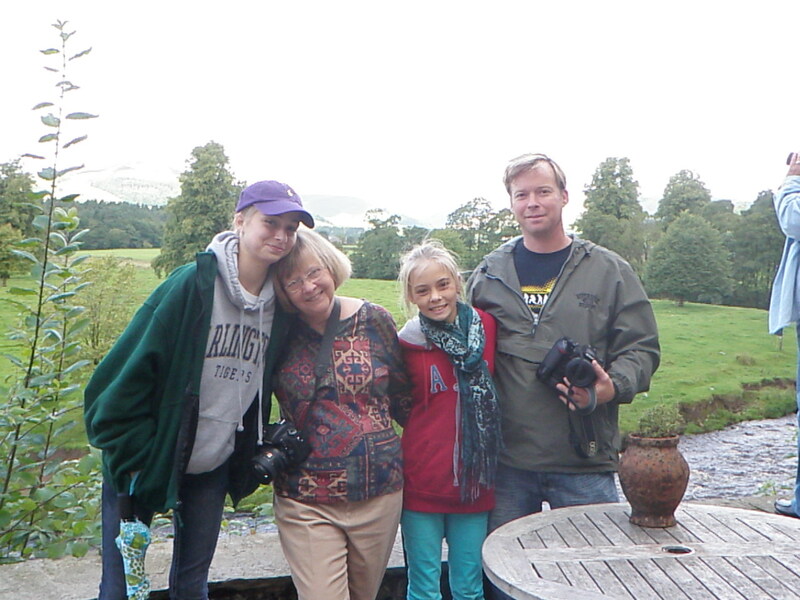 Some of the group went back to the Stirk House to rest a bit, but Jim and I stayed in the village and walked around. 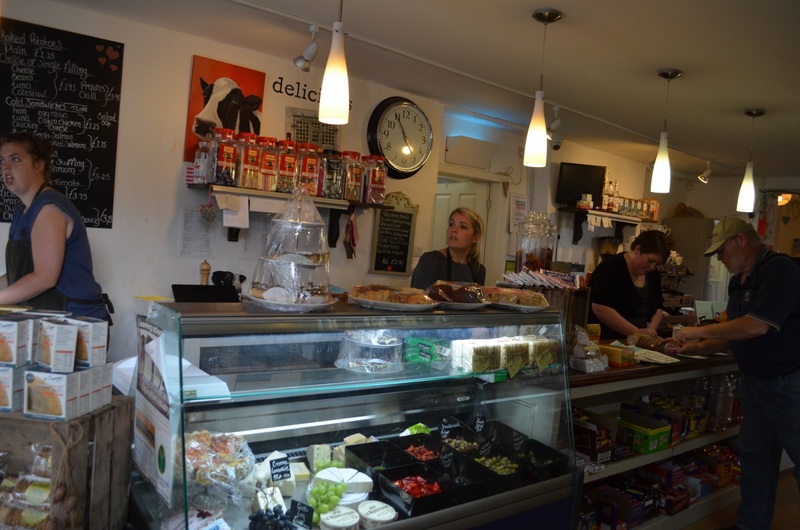 We found a corner deli and small convenience store and sampled local fare. Everything is not paved, meaning pretty much everything except the actual road was still cobblestones, probably the same cobblestones that were there when our ancestors trod these same paths. The little deli had black current sorbet and local cheeses and such. Of course, we had to purchase some, and a currant scone as well. What fun we had. Tea, in England, is served in real china teacups. Period. Here are their teacups to choose from, stacked like souvenir coffee mugs in my cabinet at home. If you tell them you want your tea “take away,” they look at you like you have lost your mind. Tea, is to be savored and enjoyed while relaxing, not taken away! What’s wrong with you Americans anyway??? Real estate is at a premium in the British Isles. We saw several instances of this type of architecture. If don’t have enough space to go around your house, just go through it. It appear from historical records that Gisburn may not always have been as tranquil as it is today. 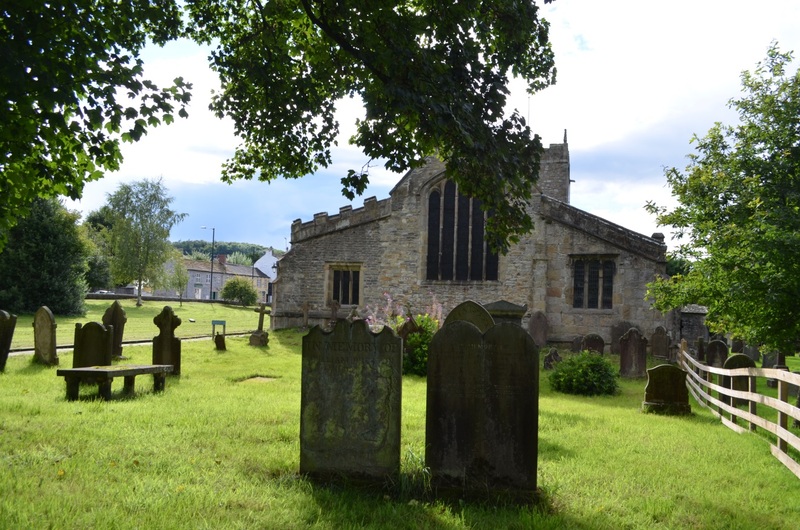 Thomas Lister, buried in the churchyard is the son of Martin Lister, supposedly killed by one of the Pendle Witches. In the 1400s, pigs roamed free through town and created so much manure that manure heaps had to be removed prior to the annual market. 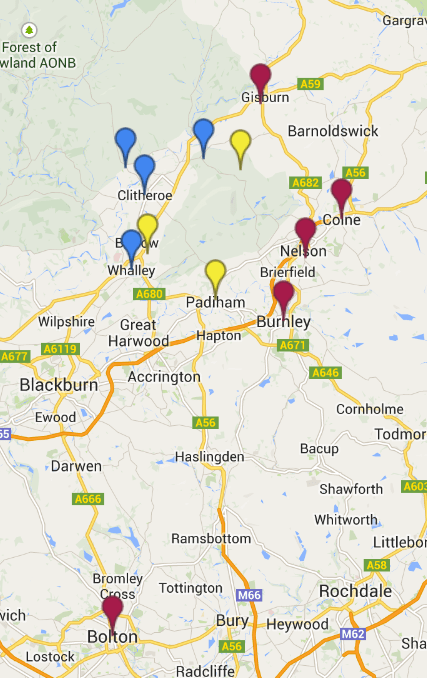 In 1401, a Vicar of Skipton, traveling the 4 miles between Sawley and Gisburn was murdered. 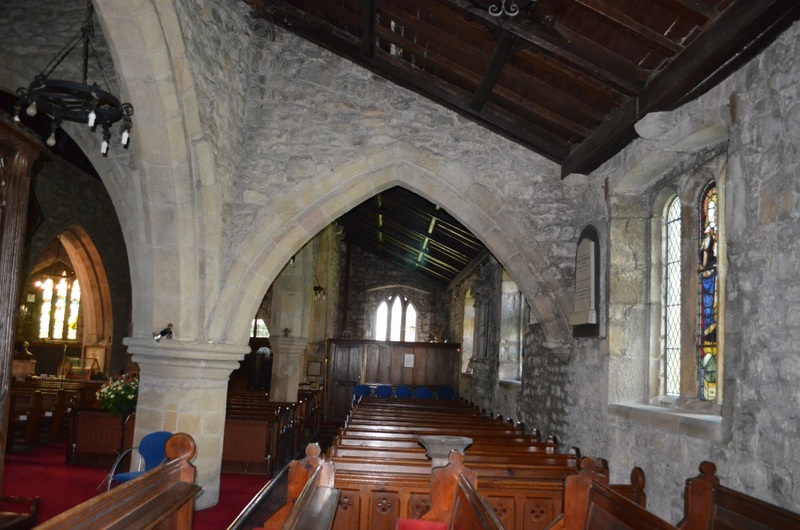 In 1648, Oliver Cromwell stayed in the village with his troops who stabled their horses in the church. The villagers complained that they broke the stained glass. Probably the soldiers, not the horses. We walked back to the restaurant where the group was meeting and sat and talked with our cousins. Jim and one cousin decided to start a beer drinking/photography club and think they should write a book called, Eat, Pray, Beer. They are convinced it will be a bestseller. They may be right. I started them off by taking their first pictures. 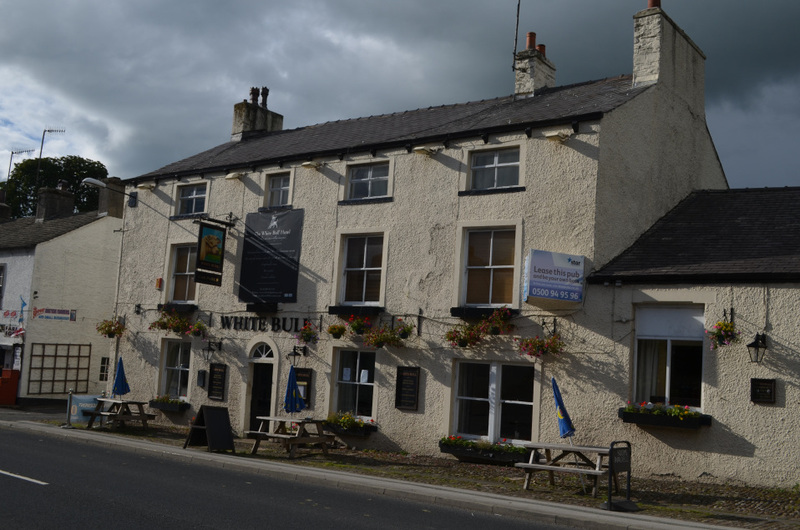 Jim and I had tried to have a drink in the local pub, the White Bull, but it was closed until 5PM. 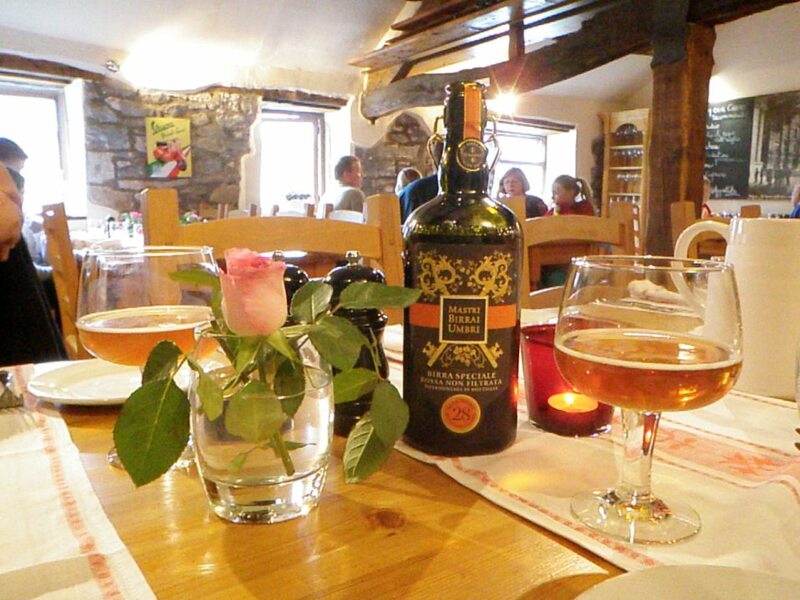 So instead we all had dinner in an Italian restaurant in the English village of Gisburn with the slowest service possible. One of the great things about visiting locally is that we met other Speak family members, including three male Speak men, Gary, Stan and David, who are certain that they are not related to each other. David, based on his genealogy, we know is a cousin of our New Zealand cousin, Doug, who matches the American line. In fact, it’s HIS fault that we are all here – because our New Zealand cousin knew who his oldest ancestor was – John Speak – the man whose children were baptized in St. Mary’s of Gisburn. So indeed, we are all quite interested in the outcome of the Y DNA testing. All three men swabbed, so before long, we will all know. So what do you think? Will three Speak men who believe they are unrelated, but with the same unusual surname, whose ancestors have lived in a remote country region of Lancashire “from time out of mind” share a common paternal ancestor based on Y DNA testing? I hope you’ve enjoyed your visit to the village of Gisburn. We surely did! Tomorrow, we go to Downham where we think our Thomas Speake may have been baptized. Every day in England gets better!!! This entry was posted in Y DNA and tagged 2013 DNA Trip by Roberta Estes. Bookmark the permalink. Roberta, “Gary said his line is not related to yours.” If two different lines have the same surname, they ARE related, just at some point BACK in time. Correct me if I am wrong. That is entirely the point. Having the same surname does NOT mean that the men share a common paternal ancestor. Surnames were adopted in many ways. Look at Smith for example. There are many Smith families and most of them are not related to each other. Only the DNA can tell us whether the 3 Speak men share a common paternal ancestor. That is the answer we are looking for. This brought back memories. 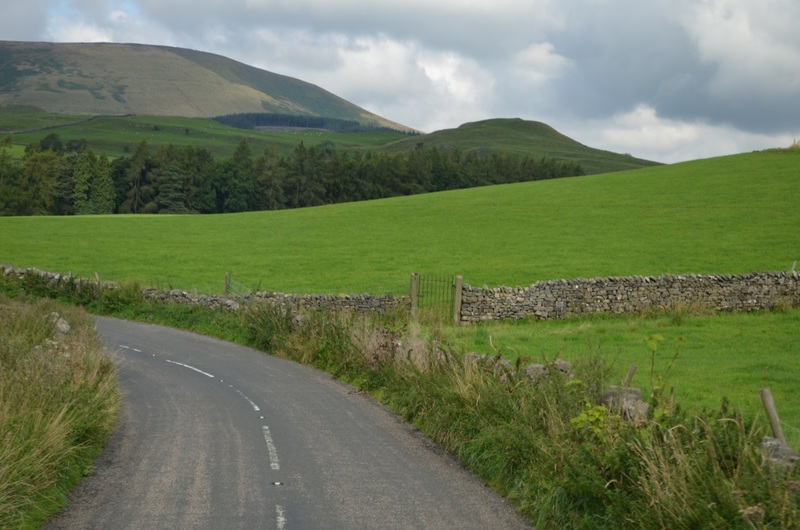 As a child I grew up in Oldham near Manchester and from time to time my father would drive us to Lancaster via Burnley, Clitheroe and the Trough of Bowland. 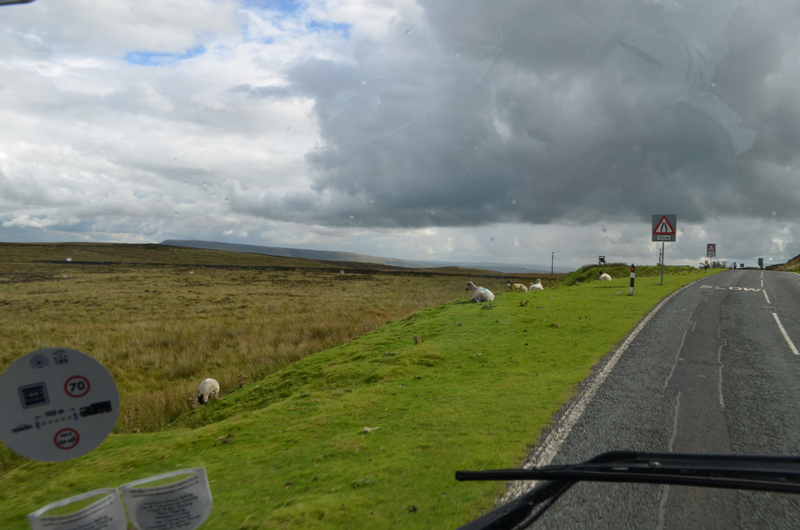 That was a beautiful drive through the Forest of Bowland, through those villages and over the moorland. 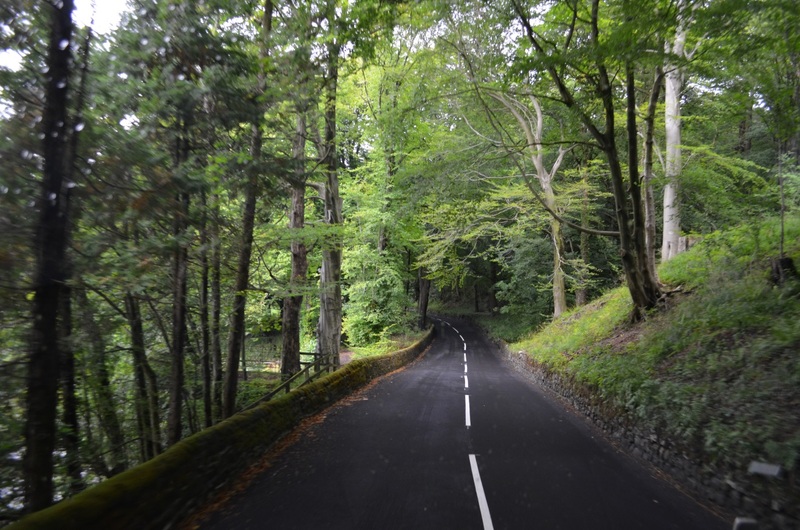 So your photos brought it all back, including the stone walls and hairpin turns. I have been enjoying your travels and look forward to each new chapter. Thanks for taking me along (armchair style). You have the loviest adventures, Roberta. Oops, I meant “loveliest” adventures! Roberta, I have enjoyed your journey so much! 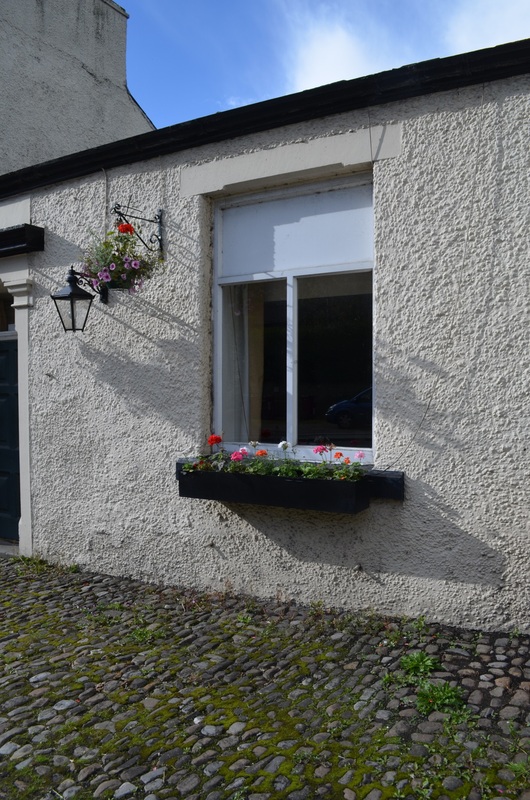 Especially excited about the history and pictures of the Ribble Valley and Gisburn. My ancestor, Isabell Hargreaves was christened at Gisburn in 1829. Her family lived at Gisburn Forest before moving to Bleasdale, Lancashire. Other kin from the area are Camm of Tosside; Gobbott of Settle and other Hargreaves from Bolton by Bowland. 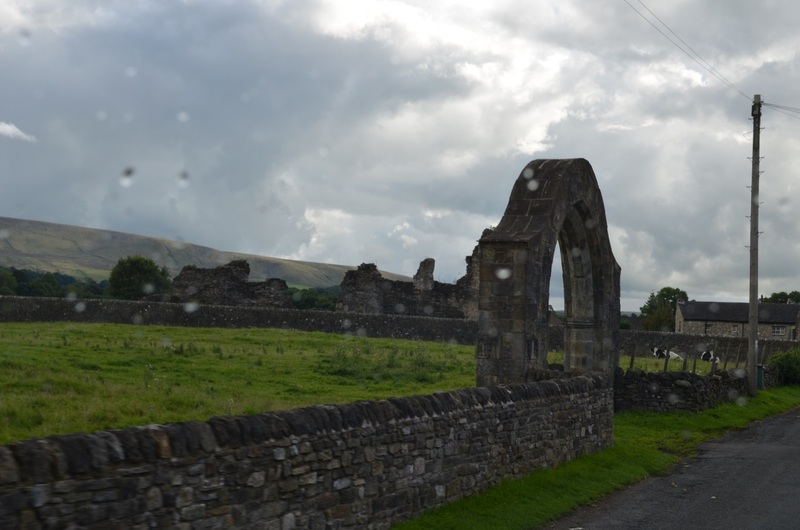 I even have a photo of the ruins at the Monastery at Sawley as a screen saver! Thanks so much for sharing your journey. I hope to make a similar one before too long! I have Warrens from Bolton, Thomas being born 1803 but can’t find much before that. His son was John Warren who emigrated ALONE to America at age 15 and at some point later married and settled in Ohio. He was my gggrandfather. I long to see that area of England. And I am really enjoying your journey! That again, regarding your UK trip was wonderful to read, I also appreciate your history lessons of the time period. Very interesting to read. You are SO blessed to have done this! What a gift, and how exciting. Thank you for sharing that with us! You are absolutely right. We were very blessed to be able to do this. It would not have happened without cousin Susan and not without DNA. 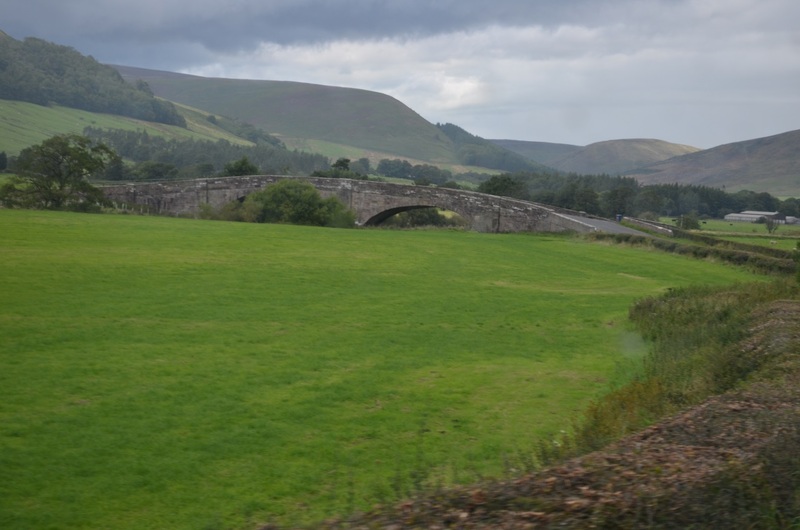 Roberta, is there a difference in this “Following the Ribble River to Gisburn, Lancashire” you sent and the other one you sent with the same title. but appears on a DNAeXplained – Genetic Genealogy face page. I have read both, think they are the same but not sure. Don’t want to miss saving any tidbits. Thanks for what you are doing. You do such a good job of writing up this information. This is the same one. Surnames came about for taxation purposes and were generally chosen by the head of the family, or by the taxation officials if the head of the family failed to come up with one. – employment. eg Smith, Cooper, Weaver, Procter, etc. – Father, eg Jackson, Watson, etc. An uncommon name from a specific area (Speake for example) has a good chance of being one family but probably every village had a smith, a cooper, a baker and a miller or two.